In Game 1, # 34 for the Phillies silenced the Yankees offense. Last night, # 34 for the Yankees did it to the Phillies. Got to give A.J. credit, he was sharp, especially that sharp-breaking curve ball. Pedro gave us a chance to win the game. He put on another clinic of how to pitch. Check out these numbers: Pedro, 107 pitches, 72 strikes; Burnett, 108/68. As usual, the Phillies battled to the end. Mariano has been nearly perfect in his brilliant postseason career and we had our chances against him. He threw 39 pitches in two innings, the most in his postseason career. Winning the first game and losing the second is a pattern the Phillies have followed in their last four postseason series. Phillies’ AMTRAK charter train pulled into 30th Street Station at 2:45 this morning. A couple of TV crews and a couple dozen fans were still awake and there. Both teams will work out at Citizens Bank Park, the Phillies in mid-afternoon with the Yankees to follow. The media interview room will feature Charlie, Cole, Girardi and Pettitte. MLB has approved 1,571 credentials for Games 3, 4 and 5. That number includes the radio and TV rightsholders . . . Hall of Fame third baseman Mike Schmidt will throw out the ceremonial first ball tomorrow night. Assisting Boys and Girls Club members in placing the game ball on the mound will be Greg Luzsinki . . . “We feel good” says Scott Eyre in his blog. Von Hayes played with the Phillies from 1983 to 1991. He’s just one of five players in Phillies history that played regularly at three different positions, right, center and first base. His postseason career with the Phillies was 1983, the NLCS vs. LA and WS vs. Baltimore. The 51-year-old resides in Florida. What is your favorite memory of October baseball as a child? As a player, what was the biggest change between the regular season and postseason? What is your fondest personal postseason memory? Where were you when the Phillies won the World Series last October? Chase gave the Phillies a lead in Game 1 for the second straight year with a home run. Last year it was off Kazmir, a lefty, this time CC Sabathia, another lefty. He followed with another solo blast in his next at bat. Oh, he also walked in the first inning. Both the walk and two homers put Chase in the record book. Cliff was brilliant in tossing the first WS complete game since 2003: one unearned run, six hits, no walks, 10 strikeouts; 122 pitches, 80 strikes. He’s the third pitcher in WS history to have no walks and 10 punch outs. Oh, he also excelled on defense, including a Web Gem, back-the-back snare of a ground ball. Lee’s been brilliant the entire postseason: four starts, 3-0, 0.54 ERA. One more note: Lee won the last All-Star Game played in old Yankee Stadium, the first game in the new Yankee Stadium while pitching for Cleveland back in April, the first WS game in the new park where the Yankees were 5-0 this postseason. 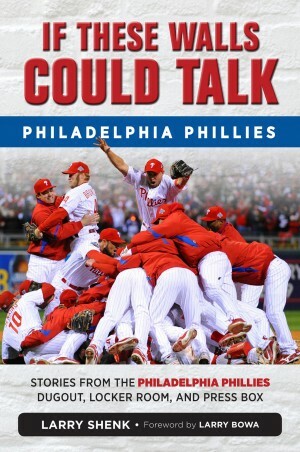 OK, one more note: Last night was the first postseason game the Phillies have ever started beyond October 27. It ranks as one of the greatest games in their postseason history. OK, OK, one more note: Highest TV ratings in Philly for a Phils game since Game 5 and 6 last year. Dave Hollins was a third baseman with the Phillies, 1990-95 and again in 2002. He also played with the Red Sox, Twins, Mariners, Angels, Blue Jays and Indians during his 12-year-career. His postseason experience came with the Phillies in 1993, the NLCS and World Series. The 42-year-old still resides in the Buffalo, NY, area. He returned to the Phillies as a special assignment scout earlier this month. Hoopla, headlines, talk, counter-talk……all is about to take a back seat as the word game shifts to the game on the field of Yankee Stadium. When Citizens Bank Park opened, it got a quick label as being a band box. Well, the new Yankee Stadium topped everything in its debut this year. Yankee Stadium: 237 homers, 136 by home team, 101 by the enemy. Citizens Bank Park: 207 total, 108 by Phillies, 99 by those other guys. ESPN.com has a ballpark factor section. Among the home run factors, Yankee Stadium is #1, 1.261. Citizens Bank Park, #16, 1,005. Phillies and Yankees met in May in the new place with the Phils winning two of three. The three games produced 12 homers (6 by each), 9 doubles, 1 triple and 11 stolen bases (6-5 Phils edge). Both parks may produce a lot of home runs. Both teams are packed with power hitters. Yet, pitching wins games. Time to Play Ball! Darren Daulton was a 25th round selection by the Phillies in 1980 who became a three-time All-Star catcher. He played with the Phillies from 1983; 1985-97 when he was traded to the Florida Marlins. His postseason career included 1993 with the Phillies and 1997 with the Marlins. The 47-year-old resides in Clearwater, FL. Robin Roberts, a member of the 1950 Whiz Kids, was on the Today Show this morning, continuing a media tour for the Hall of Fame right-hander. Nice, relaxing AMTRAK train ride to NYC last evening. Arrived during rush hour and it took a while for the four buses to get to the hotel. When we climbed out of Penn Station/Madison Square Garden, there was a pretty large gathering of cheering Phillies fans. That was neat. Woke up to rain this morning. Charlie has scheduled a workout at Yankee Stadium for 4:30, following an hour-long media session for the players. Part of the day at the hotel involved meetings with Ruben and his staff, Charlie and his staff…. reviewing scouting reports and deciding on the 25-man WS roster. Yankees and Phillies have until 10 a.m. tomorrow to e-mail their rosters to MLB. Marty Bystrom was a right-handed pitcher with the Phillies from 1980 through 1984. He also pitched for the Yankees (1984-85). Bystrom came to the majors on Sept. 1, 1980, and went 5-0 with a 1.50 ERA that month to earn NL Pitcher of the Month. He started Game 5 of the NLCS and WS that fall; Phillies won both although he didn’t get a decision. Now, 51, Marty resides in central Pennsylvania. Only once have we played on this date….well sort of. World Series Game 5 a year ago began on this date but was suspended, 2-2, after 5.5 innings. The game resumed on October 29 after a 111-hour rain/cold weather delay. Everyone remembers the outcome…a 4-3 win that produced a World Championship. Suspended games are officially recorded on the date the game was first played or started. In this particular case, that was October 27, which was the last date for any Phillies postseason game until the 2009 WS begins tomorrow night. Well, we’re now down to a seven-game season and it all starts Wednesday night in Yankee Stadium. Weather forecast is a little iffy but we’ll worry about that later. 59 years ago, the Yankees swept the Phillies’ “Whiz Kids” bunch in the World Series. Time for revenge. Hall of Famer Robin Roberts is one of six Phillies from that WS roster who is still living. He’s going to do the interview room today before the Phillies 1 p.m. workout. Robbie is also scheduled for the Today Show on Wednesday morning in NY. After the workout, the Phillies will bus to 30th Street Station to board an AMTRAK charter train for the trip north. A workout in Yankees Stadium is on the schedule for Tuesday. Phillies played there back in May, winning two of three. Tuesday also means meeting day for Ruben Amaro Jr., his staff and Charlie and his staff. Chuck LaMar, Charley Kerfeld, Gordon Lakey, Howie Freiling and Tim Kissner have been scouting the Yankees-Angels series and they’ll provide feedback. The 25-man World Series roster has to be filed with MLB by 10 a.m. on Wednesday which will be part of the meeting. Bob Boone caught for the Phillies from 1972 through 1981. During his 19-year big league career he also played for the Angels and Royals. He was a four-time All-Star and winner of seven Gold Gloves. With the Phillies he played in four NLCS and the 1980 WS (.412 average). Now, 61, Bob is the Assistant GM, VP of Player Development for the Washington Nationals. “Saw it on TV as I was in Phoenix scouting the Arizona Fall league games”. Phillies have played only once on this date and it was a year ago at Citizens Bank Park. Ryan Howard homered twice as the Phillies crushed the Rays, 10-2, in Game 4 of the World Series to take a commanding 3-1 lead. Not a cloud in the sky as the Phillies worked out at Citizens Bank Park this afternoon. They know where they’ve been, but don’t know exactly where they are going. Oh, it is either one end the country or the other. Angels and Yankees could decide that tonight. If that series goes to Game 7, the answer won’t come until tomorrow night. Charlie appeared in the interview room prior to the 1 o’clock workout. Said Cliff Lee will start game 1 on Wednesday night. He wouldn’t go beyond the Game 1 starter. Chase and Raul were in the interview room after the workout. Meanwhile, Frank Coppenbarger who handles all phases of the team’s travel, is ready. An AMTRAK charter train is on hold for a NY departure on both Monday and Tuesday afternoons. Should the Angels win, a Delta charter flight is scheduled to leave for Anaheim on Tuesday. Phillies are taking their full-time front office staff to Games 1 and 2. Transportation-wise, another airplane for Anaheim and buses for NY. All members of the player development staff–scouts, minor league managers, instructors, coaches, athletic trainers–will be brought to Philadelphia for Games 3, 4 and 5. Players are back at the park and will work out in the afternoon. Rest of weekend is uncertain as of the time of this posting. Staff is busy prepping for the World Series. New WS banners will soon be mounted on the light poles around Citizens Bank Park. The players will wear new uniforms starting Wednesday, complete with a World Series logo. People seeking WS tickets are coming from every direction. 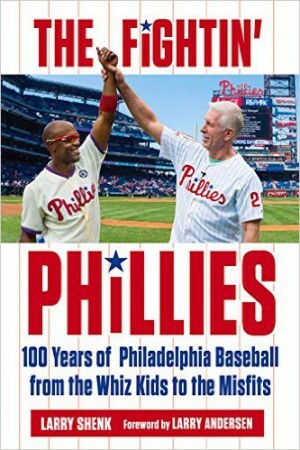 For those of you who like to keep track of time time, we won the World Championship in 1980 at Veterans Stadium at 11:29 p.m. 29 years later on the same date (Oct. 21), we won the NL Pennant at Citizens Bank Park at 11:47 p.m.
Over the last 100 years, only three NL teams have won a World Series one year and made it back the following year, New York Giants (1921-22), Cincinnati Reds (1976-77) and the Phillies. Since division play went into effect in 1969, the Reds, Atlanta Braves (1995-96) and Phillies are the only back-to-back pennant winners. Media keeps writing we’ve only won two World Series in our 127 years of existence. That is somewhat inaccurate since the World Series didn’t start un1il 1903 and our first season was 1883. So, for 20 years we couldn’t have won a World Series! The 2009 World Series will be number 105 (WS was not played in 1904 and 1994). Media inquiries have been coming in for Robin Roberts, one of six living Whiz Kids who played the Yankees in the 1950 World Series. Robbie prefers to wait until the Yankees have clinched and I agree. That’s the formula the Phillies followed last night in winning the NL pennant and advancing to the World Series for the second straight year, something that’s never happened in the history of the franchise. Last time a Philadelphia baseball team was in back-to-back WS was 1929-30-31 when the Athletics dominated the American League. When the Dodgers scored last night, the Phillies retaliated with their power bats. Cole struggled with his command but the bullpen, a weakness according to experts, did the job, big time. Then, the fans. Once again their boisterous enthusiasm was so powerful. Citizens Bank Park was rocking. Of their last 12 postseason games at home, the Phillies have won 11. Fan passion is one of the reasons. A loss last night would have been followed by a charter flight this afternoon to LA. That Delta charter aircraft was grounded in Atlanta. Phillies fans aren’t grounded, they’re flying high! Weather couldn’t be better for an October postseason game. There’s excitement in the air and game time is a long way away. Prior to the game, the interview room will be in session. Charlie and Joe and one player from each team. Sometimes MLB gets a little carried away. Both Charlie and Joe were in the interview room yesterday afternoon. Nothing has changed since then. What can they say today that they didn’t say yesterday? 29 years ago tonight, the Phillies won their first World Championship. It is only fitting that Dallas Green, who managed that club, throws out the ceremonial first ball tonight. Charlie will be Dallas’ catcher. As a manager, what was the biggest change between the regular season and postseason? “Obviously, winning the World Series in 1980 and the mind-boggling parade that followed. I remember standing in the corner of the dugout, arms folded and taking a deep breath before Tug threw the last pitch. I was never worried that we were going to lose the Series, but I wasn’t so sure during the gut-wrenching playoffs against Houston. Phillies are 2-0 on this date. They won the World Championship in 1980 when Tug McGraw fanned Willie Wilson for the final out. In 1993, Curt Schilling threw a 5-hit shutout against the Blue Jays to keep the Phillies alive in the World Series. J-Roll’s dramatic double turned Philly into giddy city last night. It has to be the biggest and most dramatic two-base hit in Phillies history. Hollywood couldn’t have written a better script. Broxton throws heat, plenty of it. He came in the eight to face Werth and got a fly ball to end that threat. Broxton’s last three pitches to Jayson: 100 mph fast ball, 93 mph slider and 99 mph fast ball. Four Dodgers relievers had thrown 57 pitches and not allowed a hit until J-Roll doubled in the right-center field alley. He couldn’t have hit it in a better location. Ruiz, no speed merchant, scored easily from first base and the celebration was on. Reality check: time to put the win on the back burner and focus on tomorrow night. There’s more work to be done. Day off….from playing a game, that is. The Phillies will work out from 1 to 1:30 this afternoon and the Dodgers, 3-4:30. Interview room will feature: Charlie (12:45 p.m.), Cole (2 p.m.), LA Game 5 starter (2:30 p.m.) and Torre (2:45 p.m.). Tom McCarthy has completed his second season in his second tour of duty as a Phillies broadcaster. After being a member of the Phillies broadcasting crew from 2001-05, McCarthy joined the Mets crew for two seasons, before returning to Philadelphia. The 41-year-old is a native of New Jersey. seven innings in the 1993 World Series, the Blue Jays rallied to win, 15-14, and take a commanding 3-1 lead.